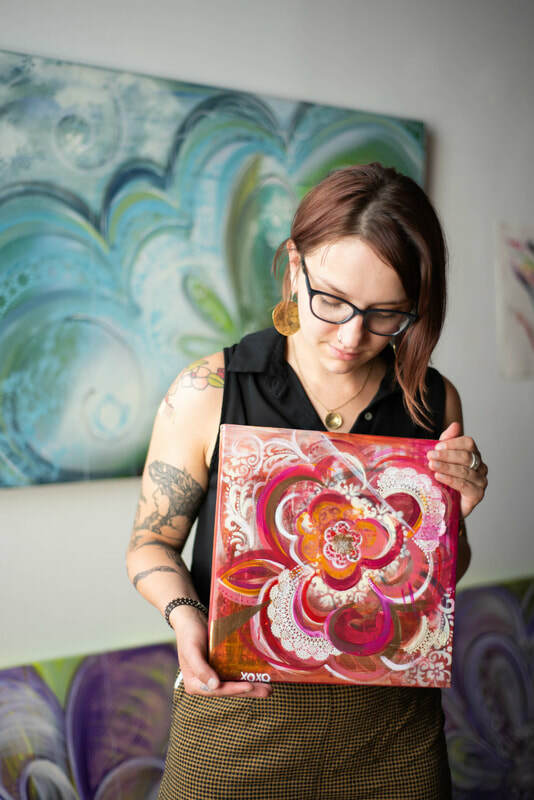 Kristina Kaiser is the creative mind behind Hohm Designs, living and creating in Rochester, NY. In 2013 Kristina earned a BFA in Studio Arts: Painting with a dual major in Art History from Edinboro University of Pennsylvania. Kristina is widely exhibited in the Rochester area and has participated in a group showcase at Oakland Terminal Art Gallery in 2015. She has also worked with WXXI and Rochester Cocktail Revival for event decor consulting. Current positions include Director and Business Owner of The Yards Collective Art Space LLC, Visitor Services and Museum Shop Manager at The National Susan B. Anthony Museum & House and member of Politits: Art Coalition. Acting as an art administrator Kristina has developed programming to help support and encourage emerging artists to reach creative success. The most acknowledged program developed by Kristina is the Yards Collaborative Residency established in 2013. In March of 2018 the vision of collaboration continues, the residency was featured by the Memorial Art Gallery for a one night event featuring the artists from the January 2018 session.